Home Uncategorized Who stands up for Maria Campos? Who stands up for Maria Campos? Nay José was walking to his girlfriend’s house last Tuesday when, according to many eyewitnesses, he was approached by the police and gunned down. Maria told reporters she had to wait in the street with her son’s body for more than 12 hours until an ambulance finally came to take him away. During that time, nobody from the police even bothered to show up. That was probably for the best. Several eyewitnesses blamed a group of officers from Caracas’ Metropolitan Police for the murder. Four years ago, the neighbors squatted on the plot of land where they now live in ramshackle houses because the authorities were turning a blind eye to such occupations. Now they regret their move; their settlement is illegal so, despite being almost destitute, they have to pay protection money to the cops to keep from getting evicted. Maria says she wants to move back to Colombia. She would feel safer there. This is the other civil war, the one you won’t hear about on the evening news because it doesn’t involve U.S. Marines or exotic jihadists. Last year, it claimed 18,381 lives. From 1999 to 2006, it ended a staggering 90,027 lives. Of course, your eyes glaze over when you read numbers like those. It’s impossible to fathom what they really mean. 18,381 or 90,027 – those are just statistics. What happened to Nay José Campos, though, is a tragedy. It’s a reality strangely absent from our political conversation. Public debate in Venezuela can be high-brow, as when we talk about U.S. policy toward Latin America, or trivial – like when chavista political parties play hard-to-get about joining Chavez’s single party. A lot of the time it’s just repetitive: each new day we hear a fresh tale of the President handing out millions to his friends overseas. That’s the Venezuela you meet on the front page of the newspaper. The real thing, though, is hidden away in the back. The real Venezuela is the Venezuela of the Sucesos page – our grisly daily newspaper crime roundup. These are the stories that matter the most, the ones that mark a before-and-after point in the lives of those they touch. Stories about bloodied bodies and lives destroyed, about families ripped to pieces and teenage love affairs that end in a morgue, all on a scale you usually associate with war time. There’s no ideology in the Sucesos page – just the unbearable pain of meaningless violence, almost always inflicted on the very poor. These are the stories the government doesn’t want to talk about, because they lay bare its failure to deliver the thing people care most about. Chávez fans overseas marvel at the government’s social programs, but these programs didn’t really help Romer Romero. Romer was caught in traffic on board his Yamaha motorcycle, the one he used as a moto-taxi to make ends meet. He was gunned down by the two muggers who took his bike, after they had already taken off with it. The same day, four other moto-taxi drivers were murdered. Romer was 23. If Romer lived in a country with a future, he wouldn’t have had to go out into Caracas’ dangerous streets to sell rides on his bike. The same could be said of Keni Brito, who was also gunned down by two muggers after taking the sparkling new bike he’d just bought ten days earlier. Keni left behind a six-year old daughter. At least three moto-taxi drivers are murdered in Caracas each week, thanks to a bustling black market for motorcycle spare parts. If it cared to, the police would be able to tackle this problem: find the spare parts sellers, make your way up to their suppliers, and you’ve found your killers. But doing so would require political will, something this government simply does not have. People are so desperate for resolution they’ve ended up taking justice into their own hands. Just last week, neighbors in the La Aduana sector of Puerto La Cruz lynched the murderer of a local woman and left his corpse on the street. The state police finally showed up, but only to collect the body. No questions were asked. Sometimes, the cops make an effort, but their operations are so haphazard, it leaves neighbors feeling even more vulnerable. Take the case of the Giovannito gang. Last week, a commando from the Metropolitan Police ambushed the band deep inside La Vega, one of Caracas’ most dangerous slums. While the leader of the band was killed in the shootout, the police’s heavy-handed approach – they even used a helicopter – did not prevent nine of the gang members from fleeing and hiding in the nearby mountains. They were never caught, and now the neighbors are terrified as they await their return from the hills. 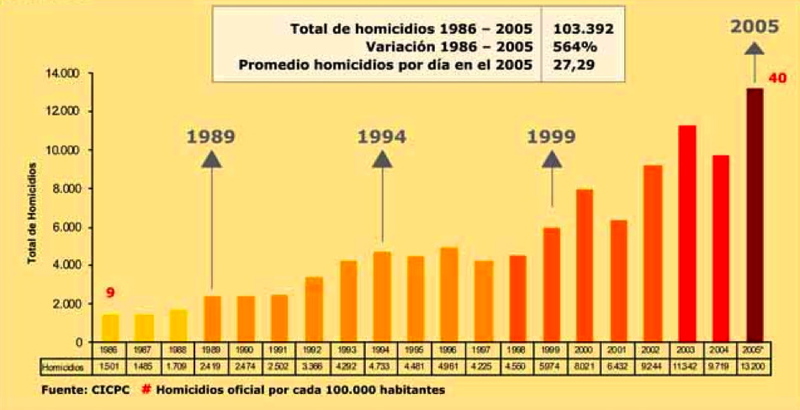 So while people such as the taxi drivers of San Félix – 28 of them were murdered in 2006 alone, and six have been killed so far in 2007 – protest the government’s failure to deal with the threat they face, we debate whether or not Barbara Walters is on Chávez’s payroll. While the return of the locha makes the front page, 25-year-old Carlos Martínez’s death while going to buy candy for his kids is buried in the Sucesos page, along with the deaths of 27 other people in Caracas over the weekend. Wide-eyed foreigners think this is a government that cares about poor people. Eating up the propaganda the government feeds them daily, they buy the line that chavismo is all about empowering the poor and honoring their human dignity. But while you wonder whether there is anything the government can really do, or question whether it is even their fault, ponder the fate of 20-year-old Carlos Hilton. Carlos was gunned down in Petare Saturday night, right in front of an abandoned Metropolitan Police barrack. His murder, like tens of thousands of others, will most likely never be solved.